Accidents happen. But that doesn’t mean you have to be caught out. This handy dash cam packs huge features into a compact package so you can capture every moment without a bulky camera obstructing your view. 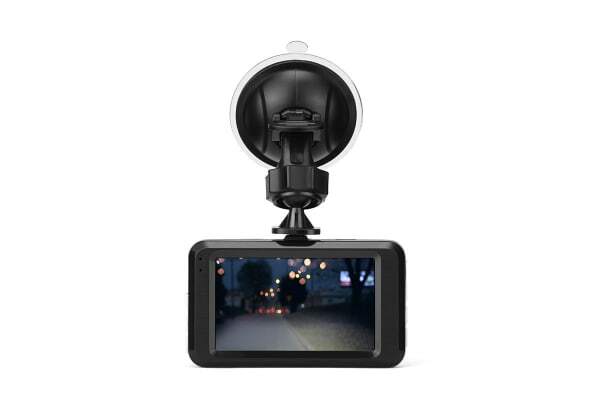 Let safety take the front seat with the Kogan Car Dash Camera Video Recorder – there to protect you in case of accident disputes or potential insurance fraud. Night or day, this miniaturised dash cam will capture it all in Full HD. Clearly make out even the minutest details in almost any light, from license plate numbers and facial features to street signs. With the camera’s superb night vision with six LED lights, Full HD 1080p resolution and 140° wide viewing angle, you’ll never miss a thing. Plus, all footage is stamped with the time and date in case of disputes. This small but mighty dash cam is equipped with a G-sensor that automatically locks the recording the moment it detects a strong impact – either from a collision, sudden stop or heavy breaking – to keep the cam from looping over important footage. In case of hit-and-runs or vandalism, the Park Mode detector automatically powers on when it detects motion to record 15 seconds of video footage using the internal battery. The dash cam also features a Photo Mode and microphone, so you can really capture all the nitty-gritty details. The dash cam’s small size means that it won’t pose an issue while driving, while the looped recording means you’ll never have to worry about replacing your memory card, as the cam automatically overwrites old footage. If you do require extra storage, the cam supports 8,16 and 32GB memory cards. When there is a collision or sudden change in the XYZ axis of your vehicle, the G-sensor determines the direction of the collision and records the event.